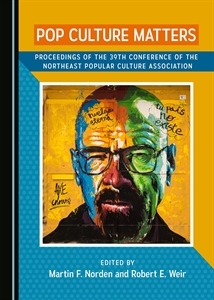 The Northeast Popular Culture Association (NEPCA) will be having its annual conference in Portsmouth, New Hampshire this year. And I’m looking for interesting and unique proposals around teaching and popular culture. Therefore, I’m quite interested in hearing from people and encourage anyone who may teach a popular culture focused course or use popular culture in interesting and useful ways to put in a proposal. Here are a few of the formats that I’m interested in seeing and/or participating in. If you have questions or thoughts about these, please don’t hesitate to contact me: lance.eaton@gmail.com. I’ll throw my hat into the ring with this one. I’m really interested in working with and presenting with other faculty who have or regularly teach popular culture (or focus in some ways on popular culture) in an online environment. I think there is a lot to discuss and explore with regards to this topic and would encourage anyone else in this vein to reach out to me. In the last few years, we’ve seen some really great panels that include students and their experiences in learning and studying about popular culture. I think this is a great area for collaboration between faculty and students and if you have an idea, you should definitely consider submitting. Honestly, if you’ve got something related to teaching and popular culture, please submit a proposal. Every year that I’ve done this, we get some really fantastic presentations on a range of great topics relating to teaching and popular culture. If you’re stuck on the fence or need someone to brainstorm and flesh out your proposal a bit more, feel free to reach out to me and we’ll see what we can come up with. So if you are interested, please check out the conference page before going and filling out the proposal form. If you’re interested in putting in a proposal that isn’t Teaching and Popular Culture, then check out the other areas to determine which is the right area to submit. The deadline for applications is June 1, 2019. Proposals must be submitted to an online Google Form that can be found on NEPCA’s Website. This page also includes a link to area chairs who can assist with any questions you have about your proposal.